Here in San Francisco, you can spot a hipster by way of his beard, girlishly-skinny jeans, knit cap (in spire of the 65-degree weather), and distinct aura of lackadaisical douchey-ness. 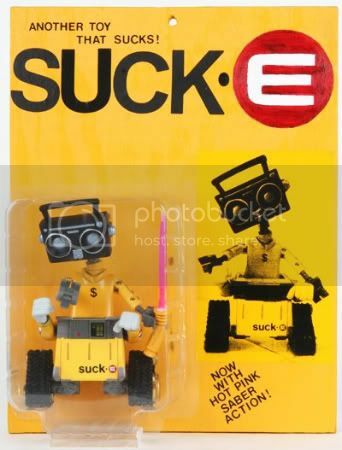 A look through the Suckadelic official site and MySpace page suggests that bringing “nerdy obsessions to the heights of hipster cool” means that Mr. Sucklord crosses geeky characters with track suits, boom boxes, and graffiti art (i.e., the late 1980s rap scene) to produce custom toys. When Senor Sucklord, Esq., isn’t giving perfectly good toys the Run D.M.C. treatment or remixing tracks called “Trials of a Jedi,” “Behold Galvatron,” and “Gremlins Dust,” he sometimes vandalizes Star Wars AT-AT toys for charity. Next post: Geek Steal: Seasons of The Simpsons for $14.99 Each!